"He happily scooped Sailor up for a cuddle," the child's mom said. camera (Jessica Nash Donnahoo) Rob Kinney, a technician with Spectrum, came to Jessica Nash Donnahoo's home to set up TV streaming and held her 3-year-old son Sailor while he worked. 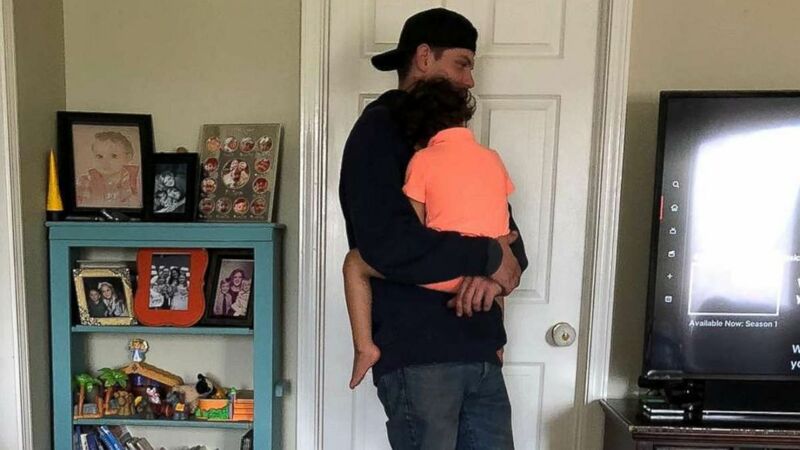 When a cable technician visited Jessica Donnahoo's home in Greenville, South Carolina, on Saturday, he did more than just set up their TV for streaming — he got a whole lot of cuddles from a fussy little boy and in the process helped a mom who really needed a hand that day. Rob Kinney has been working for Spectrum for nine years, he told "Good Morning America," and on Saturday, March 16, Donnahoo's home was on his list. That day, Donnahoo told "GMA," was "chaos." Her 3-year-old son, Sailor, was adopted at birth after years of infertility, she said. He was born with two rare brain defects, too. One of them is optic nerve hypoplasia, which caused him to be blind since birth, she said, noting that he has what's known as a Chiari malformation of the brain. Sailor also has a seizure disorder. Due to his blindness, Sailor has heightened senses and sensory issues, she said. He often gets overwhelmed by new textures and sounds. He doesn't eat solid food and lives solely off of Pediasure, Donnahoo said, and he cannot differentiate day from night, so he often wakes up throughout the night. All of these issues culminated in Sailor being extra fussy on that Saturday, Donnahoo told "GMA." But it also came to an end when Kinney arrived. "When Sailor heard Rob the Spectrum technician speak, Sailor walked over to him and reached his arms in the air. Rob didn’t ignore him or turn him away, but instead, happily scooped Sailor up for a cuddle," Donnahoo said. "He had to occasionally put Sailor down so that he could plug in equipment or go out to his truck, but otherwise, he held Sailor off and on for the entire 45 minutes that he was in our home." 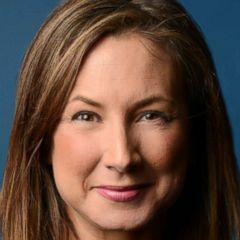 Donnahoo, who said she often holds Sailor in a baby carrier, used that free time to fold and put away laundry that she said was "covering her couch." "I said, 'You want me to pick you up buddy?' while looking at her just to get a feel or not if it would be a problem," Kinney told "GMA." "She seemed OK with it so I picked him up and held him while I was doing a few things inside. He was super comfortable with it to the point he started getting sleepy." Having a child in his arms didn't stop Kinney from doing the work he had to do. "He would bounce Sailor using one arm to hold him and make internet adjustments with the other. As a momma, I was incredibly grateful for his kindness," Donnahoo said. People around the world have been moved by Kinney's kindness just like Donnahoo. Her now-viral Facebook post has been shared over 118,000 times. Kinney is a single dad to a 4-year-old and that's one of the reasons Donnahoo thinks he stepped up. "He understood the need for help, saw an opportunity to help another human being and took it," she said. "I think the reason that this act of kindness has resonated with so many people is that we can all relate — as parents, grandparents or just anyone who has been overwhelmed. In a world of mass shootings, political scandals, and drugs, we all need to be reassured that humanity and kindness still exist. Rob and my post did just that." Kinney, however, would like to give credit where he feels it's due. "For them to adopt him and take care of him on a daily basis is much more than what I did for a short period of time," he said. "God really has blessed that family and will continue to do so because of the kind and gentle spirit they have. They deserve more recognition than anyone."